1st printing. 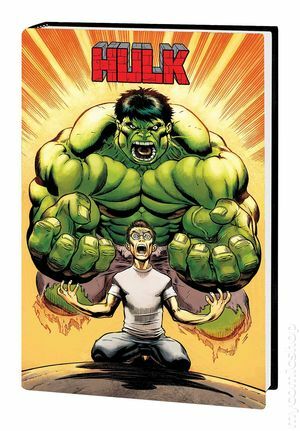 Collects Hulk (2008-2012 Marvel) #1-24, King Size Hulk (2008), Fall of the Hulks: Gamma (2009), Hulk-Sized Mini-Hulks (2011 Marvel) and material from Incredible Hulk (2009 3rd Series) #600 and Wolverine (2003-2009 2nd Series) #50. Written by Jeph Loeb and Audrey Loeb. Art by Ed McGuinness, Art Adams, Frank Cho, Ian Churchill, Whilce Portacio, Hern Trimpe, Tim Sale, Dale Keown, Sal Buscema, Leinel yu, and Gerry Alanguilan, John Romita, Jr., Klaus Janson, Mike Deodato, Chris Giarrusso, Carlos Silva, and Dario Brizuela. Cover by Ed McGuinness. There's a sadistic new red-skinned Hulk in the Marvel Universe. Who or what is he? One thing's for sure: He's a Hulk with a mission...and it'll be an explosive battle when he collides with the original green-skinned goliath! As Marvel's greatest minds try to uncover the Red Hulk's secrets, She-Hulk calls in the cavalry to bring him down! Meanwhile, Rick Jones adjusts to a startling new status quo - and what's wrong with Doc Samson? When Domino sees too much, Red Hulk assembles a hit squad to silence her. But whose side is the new Red She-Hulk on? And when Red Hulk's mysterious backers stand revealed, can Marvel's greatest heroes halt an unstoppable red tide of destruction?